Week 14 in the NFL with the public over 70% on six of the games! Will it be that easy??? We had a very busy day yesterday with 10 one unit plays. In College Hoops, we went 3-3. NBA 0-2 and NHL 0-2. For the details of the plays, you can take a look at the spreadsheet I update daily with all the plays, lines and results. We started off in pretty good shape heading into the 5:00 games. 3-1 in college hoops and a loss in the NHL. But then the late games went 0-5:( And none were particularly close at all. So we find ourselves off about 7 to 8 units for the month which if this is causing you any concern at all you might want to consider a way to get your mind right or quit sports betting. Myself on my own account I do not even give it a thought. I have taken the emotion out of sports betting. I view it merely as an intellectual exercise and am amused by the ups and downs that my betting account goes through. 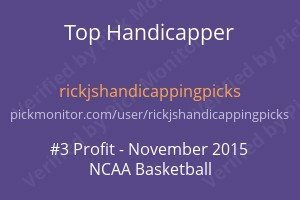 The reason I can do that is because I have picked a betting bankroll I am comfortable with. If you do not do that you will tear yourself up when you have a drawdown. It’s not worth it. Now I have to admit I use the 3% number for my bet sizing. This should be used for only the most hardened and disciplined sports bettors. The swings while 3% sounds minimal is a very large number to use for daily bets. I do it because I still have a bit of gamble in me( hard to eliminate it all) and the swings do not bother me at all. They amuse me but do not bother me. 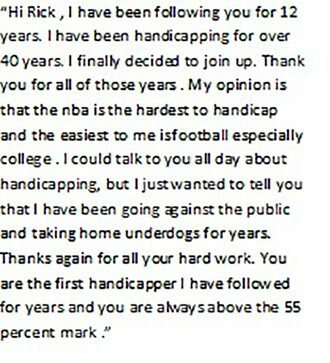 So only the most disciplined and experienced bettors who have shown an ability to win at sports betting could use the 3% number. I strongly recommend 2%. Let me also mention I am always available for discussing bankroll and bet sizing that is appropriate to your individual situation. Not only do I have a very analytical mind but also substantial experience in this gambling world. So you most likely will find my advice on the subject valuable. 1. There is no easy money to be made here!!! Less than 1% of sports bettors make money consistently betting sports daily. Of the ones that do they have all to the last one harnessed whatever tilting tendencies they have. Everyone has them, few can keep them in check. 2. Downswings can be severe in sports betting. We have been fortunate enough not to have many that would fall into the severe category. I do not consider a 20 unit downswing severe. However when you get to the 40 to 50 unit downswing area you are in a severe territory. This can happen and if you bet long enough it will happen. It’s just the nature of variance. 3. I am often asked how many units a year do you produce. For this site, it’s very easy to discern as all you need to do is go back over the last 10+ years of results that I have on the site and it will give you a good idea of historically what my plays have produced in each sport. It will take you maybe upward to 1 to 2 hours to go through everything but it’s well worth the effort. But let me mention that for professional sports bettors no one gets in the >100 unit a year category. Some of the best in the business are content with 30 to 50 units a year. Now the intent of the above is very similar to the intent of the “must read” portion of this site. It’s a reality check that I feel gamblers need to go through from time to time. When we have a bad day or a downswing I take that opportunity to remind subscribers and others that follow this site the realities of sports betting and gambling. Now let’s get to the NFL! The first 3 are my traditional picks. Jets is just a San Fran fade play. I usually do not take these but they have a quarterback problem that is very unique. Denver is another unique play. The numbers did not go as I anticipated when I put the plays in. But there is one variable I follow that seems to be very different than most in that public numbers do not seem to affect it. And since I had nothing else I liked I through Denver into the mix. This season at this point in the contest is pretty much the worst I have been since I have been entering the contest. I sit at 29-33-3 after a blazing start to the season. The only thing I am still in the running for is the mini contest that begins week 15 for 3 weeks. The prize is 15,000. It will take most likely 13-2 to win it. Animal spirits are very high with only 4 games below 60% and 6 games at 70% and above!